Evil is not a primary color. That is the point of the Wachowski brothers' video-arcade treatment of "Speed Racer," insofar as one can be determined. Blue, you can trust. Red and yellow, black and white -- they're all decent visible wavelengths. It's purple you have to watch out for. This is notable only because whatever information that passes from your retinas to your brain during "Speed Racer" is conveyed through optical design and not so much through more traditional devices such as dialogue, narrative, performance or characterization. Like the animated TV series that inspired this movie, you could look at it with the sound off and it wouldn't matter. "Speed Racer" is not a feature film in any conventional sense -- although there is nothing so conventional in today's marketplace as a corporate product based on a campy vintage TV show that is developed for extremely brief exhibition in multiplexes on its way to more appropriate platforms such as DVD and video games, which provide the principal justification for its manufacture in the first place. Neither is "Speed Racer" a commercial avant-garde film (though fans of the Wachowski brothers may wish to make such claims), unless you still consider Laserium shows of Pink Floyd's "Dark Side of the Moon" to be cutting edge. (Lights! Shapes! Colors! Motion! Money!) And there's nothing terribly adventurous these days about Eisensteinian montage treated as if it were William S. Burroughs' "cut up" technique -- with digital clips randomly scrambled like pixelated confetti. Nor is it some kind of subversive commodity, unless the outré strategy of pandering to a low-brow, retro-nostalgic crowd can be considered anything but business as usual in 2008. The faux naivete on display here -- right down to the imitation-fruit-flavored FDA-food-dye coloring -- is both shamelessly quaint and shamelessly cynical. For a certain generation of American kids, "Speed Racer" was our introduction to the lo-fi animated form now known as "anime." At the time, we just thought it was cheapo Japanese animation: flat, static, dubbed into badly translated English and barely "animated" at all, given that the frame only seemed to change approximately two times per second and the "moving" backgrounds were made up of about four cyclically repeating drawings instead of the eight or so we were used to seeing in Hanna-Barbera cartoons. The faster Speed went, the slower the sequence of backgrounds. Wow. To us, this show was just filler between after-school reruns of "Gilligan's Island" and "The Munsters." We watched it because it was on, and it was in color. Now the Wachowski brothers (of the "Matrix" movies) have spent $100 million on a mixture of photography and digital animation and called it "Speed Racer." They have captured (almost) all the chintziness, inexpressiveness and incoherence of the TV show in two hours and nine minutes, or about two hours too long, give or take. Yet some of us would just rather re-rent "Tron" (1982), which was not only a more immersive, dimensional and original take on the Commodore 64 video-graphics aesthetic, but also funnier and more exciting. 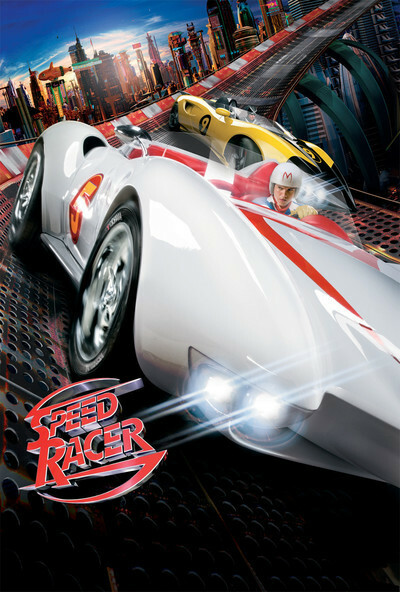 The live-action components of "Speed Racer" include Speed himself (Emile Hirsch, consigned to anonymity again after a breakout performance in "Into the Wild"), who lives with his Mom (Susan Sarandon), Pops (John Goodman), mischievous little brother Spritle (Paulie Litt), pet chimp Chim-Chim (Kenzie and Willy) -- as well as, apparently, his mechanic Sparky (Kick Gurry) and his gal-pal Trixie (Christina Ricci). They all love Mom's pancakes. Speed once idolized his big brother Rex Racer (Scott Porter), who died in a fiery car crash as idolized big brothers named "Racer" will sometimes do. Rich, evil, purple-clad industrialist Mr. Royalton (Roger Allam, as Tim Curry) woos Speed with a lucrative offer, but when the hotshot turns it down in favor of sticking with Pops, Royalton threatens to destroy all Racers. Fortunately, the mysterious Racer X (Matthew Fox, displaying fewer emotions than Jack on "Lost") zips in to help out. As an elementary schooler, Speed is afflicted with foot-tapping hyperactivity and ADD, and so is the movie. A lot of fluorescent, 7-Eleven-tinted images flash by, any of which could easily be removed or re-arranged without significantly disrupting the film's continuity, because it has none. If you can determine the spatial relationship between Speed's Mach 5 (or Mach 6) and any other race car for more than a few consecutive seconds, then good for you. As on the TV series, the pictures don't seem to move so much as repeat -- movement with no momentum. Transitions are handled with wipes in which large closeups pass from one side of the screen to the other without ever getting anyone anywhere. If non-pixel illumination was used in the (mostly green-screen) shooting of the movie at all, it appears to have been black light, which gives everything a phosphorescent, psychedelic-poster sheen. At various times, the visuals resemble "Blade Runner" reinterpreted by Roger Dean (of Yes album cover fame), "The Jetsons" rendered by Maxfield Parrish, or a bag of Skittles designed by Shag. "Speed Racer" is a manufactured widget, a packaged commodity that capitalizes on an anthropomorphized cartoon of Capitalist Evil in order to sell itself and its ancillary products. Corporate partners in the venture include General Mills, McDonald's, Mattel, Topps, LEGO and Target, who have furnished no promotional consideration for mention in this review.